Hands On With The New iPad Mini: Lighter, Costlier Than Rivals : All Tech Considered Apple unveils a smaller version of its popular iPad tablet. NPR's Laura Sydell gets a hand-on look and finds that the iPad mini is lighter and thinner than she expected. But starting at $329, is it too expensive to compete with other small tablets? The new iPad Mini is displayed after its unveiling at an Apple event in San Jose, Calif., on Tuesday. Apple has unveiled a smaller, cheaper version of its popular iPad tablet. 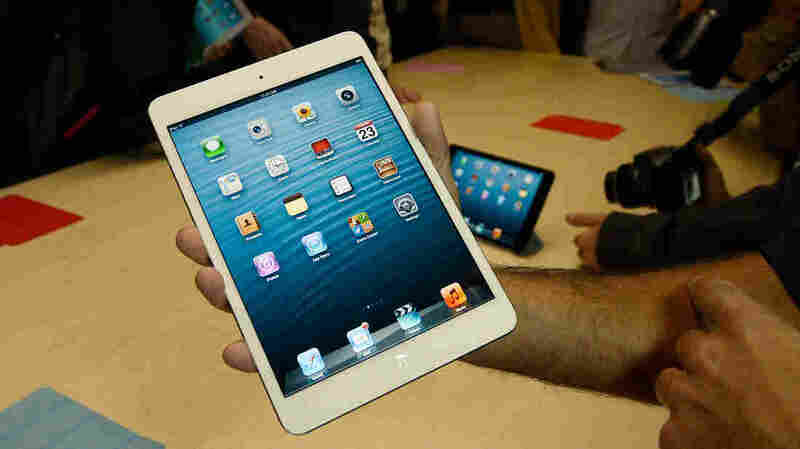 NPR's Laura Sydell attended the event Tuesday in San Jose, Calif., and got a hands-on look at the new iPad mini. Below are her first impressions. When I picked up the iPad mini I almost tossed it over my shoulder because I'd been using a lot more strength than I needed to lift it. At .68 pounds it's actually half the weight of the larger iPad. But it felt lighter, as if I was lifting a large cracker and at 7.2 mm it's about as thin as some crackers. The new iPad mini actually seemed delicate to me, as if I might break it. I've tried two of the other dominant players in the 7-inch tablet market, the Google Nexus 7 and the Kindle Fire HD. Both weigh slightly more. Yet neither one gives as much screen space as the iPad. The mini has 7.9-inch diagonal versus 7 inches for the Nexus and the Kindle. Still, it's small enough to fit easily in a purse and it's large enough for easy typing. An A5 dual-core chip inside makes the interaction smooth and fast. Just from my own short experience at the Apple demo it seemed to be faster than either the Kindle HD or the Nexus 7. But, consumers will pay for the speed and features like the 1080p HD video, which is better than either of the other two competitors. The entry-level iPad mini costs $329 versus $199 for the entry level Kindle HD and Nexus 7. The late Apple CEO Steve Jobs said he didn't understand why anyone would want a 7-inch tablet. But, the success of the Kindle and more recently Google's Nexus 7 has shown that there is a market. Apple clearly knew it was going to have to compete since its share of the tablet market has gone down by about 12 percentage points since 2010, the year of the original iPad's release. The question is whether people will be content to lay out an extra $129 for the little extras and of course the cache of the Apple iPad mini. Wall Street didn't think so. After the announcement Apple's stock took a dive. But, it wouldn't be the first time that investors have underestimated the appeal of Apple products.